A New South Wales man has been charged with terrorising a family at a picnic in what police will allege was a suspected Islamophobic incident that could have been “catastrophic”. Yusuff Sharriff, 43, is accused of intimidating and verbally abusing a family group of about 20 people picnicking in the Illawarra on Sunday afternoon. Police will allege Mr Sharriff threatened the family from Western Sydney yelling “f*** you, f*** you, f*** you, Muslims. I’m going to f***ing kill you,” and circling them with his car. Wollongong Police Commander Superintendent Chris Craner said the vehicle was only metres from young children playing at the Bulli Tops picnic ground. “That grassed area was full of mud, the car was going sideways,” Superintendent Craner said. Mr Sharriff was arrested in a carpark nearby and charged on Sunday night. He was refused bail in Wollongong Local Court on Monday after his brief appearance via video link from the police cells. Magistrate Michael Stoddart said the allegations were “disturbing”. He described the alleged incident as an “atrocious attack” that police claim was part-filmed on a go-pro by an onlooker. “He goes away, he comes back minutes later threating to kill these people,” Magistrate Stoddart said. During his appearance in court Mr Sharriff referred to himself as a “black Muslim” and accused Legal Aid of discriminating against him and not representing him properly. He urged Magistrate Michael Stoddart stop the case progressing until he could find a new lawyer and said he had been the subject of abuse in the past. Police say the family at the centre of the allegations have been left shaken by the incident. “The women at the time were crying, there were young kids there,” Superintendent Craner said. “It’s just a tragic event what this family has been put through and as you can understand they’re quite shaken by it all. Mr Sharriff is scheduled to reappear at Wollongong Local Court again on April 23. He has also now been referred to the Fixated Persons Unit for assessment. 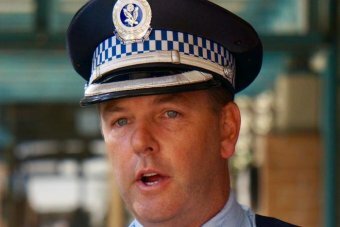 The Fixated Persons Investigations Unit was set up by NSW Police two years ago to focus on so-called “lone actor” and “fixated person” threats and grievance-fuelled violence.